Globalisation and the intersection of Western influences and established Islamic ideals are creating an interesting religious, social and political climate in modern Indonesia. Western dress, behaviour and attitudes increasingly proliferate the country, facilitating a rise in consumerism, among other cultural shifts. While Islamic, more conservative, dress used to appear along side Western clothing, it is now being increasingly integrated into this market in response to Indonesia’s modern social climate. While on the surface, Western consumerism and Islamic dress seem to clash, in actuality the intersection of these two factors are facilitating a new design paradigm (Jones 2007) with the creation of a local Islamic Indonesian fashion industry. Indonesia Fashion Forward has been created in response to this and is a collaborative project aimed at “building [a] program with a vision to bring a selected number of designers to a regional and global platform”(Jakata Fashion Week 2015) through business and strategy assistance. Busana Muslim (Muslim Fashion) is emerging in a myriad as ways which reflect the different observations of Muslim faith within Indonesia. Restu Anggriani is a young fashion designer whose clothes aim to provide solutions for women who engage with Islam in different ways. In regards to her latest collection, her husband and business manager explains, “If you look at this dress, it’s actually quite form fitting. But then we add these accessories, like jackets and cardigans, to cover the shape of the body. We say to our customers, it’s up to you. There might be young people for whom this is Muslim clothing, but a bit rebellious. But if you add (a jacket, for example) it’s more syariah.” (Sharpe 2014). In this respect, the Indonesian fashion industry is developing in a way which reflects its societies modernity and globalisation. It is also argued that by making traditional dress more enticing and accessible, young Muslim women will be increasingly likely to adopt more ‘correct’ forms of dress (Sharpe 2014). Islamic fashion designers in Indonesia are also turning to traditional print forms as inspiration for their lines, appropriating and recontextualising Batik patterns (Jones 2007), giving them a modern context in contemporary Islamic fashion. In response to socio-economic growth and globalisation, Indonesian fashion design is progressing in a way which reflects the complex intersection of modernity and religion. This social and religious climate has facilitated the creation of an industry that is unique to Indonesian context but which is also relevant to the modern Islamic community at large. 2 – Jones, C. 2007, ‘Fashion and Faith in Urban Indonesia’ vol. 11, issue 2/3, Berg Publishers, England, pp. 211-232. The rapid technological advancements prevalent in our contemporary society enable more powerful and desirable technologies to be released in increasingly shorter spaces of time, creating vast amounts of obsolete machines that lack appropriate avenues of disposal. The nature of design practice creates problematic electronic waste output as industries dispose of this rapidly growing waste in irresponsible and exploitative ways. There is little discourse regarding the issue of electronic waste in contemporary society, despite the inextricable link between our culture and vast arrays of technology we depend on. In the current system, the consequence of irresponsible e-waste disposal lies not with the consumers, but with the disenfranchised, impoverished workers and inhabitants of second and third world countries, where e-waste dumping sites can exist without the same management law, necessary infrastructure and safety concerns affluent economies would stipulate (Oteng-Ababio 2010). This consequence manifests itself both monetarily and societally, as disempowered workers are exploited at low-wage to dismantle the electronics used and discarded by the rest of the world. The practices in these plants, like Guiyu in China and Agbogbloshie (a former wetland) in Ghana, are loosely regulated, if at all, (Greenpeace 2012) and employ workers often uneducated in the danger and severity of the materials they are exposed to. But one designer in the small West African nation of Togo is using innovative design solutions to combat this problem and reduce the amount of harmful electronic waste being dumped in landfill. 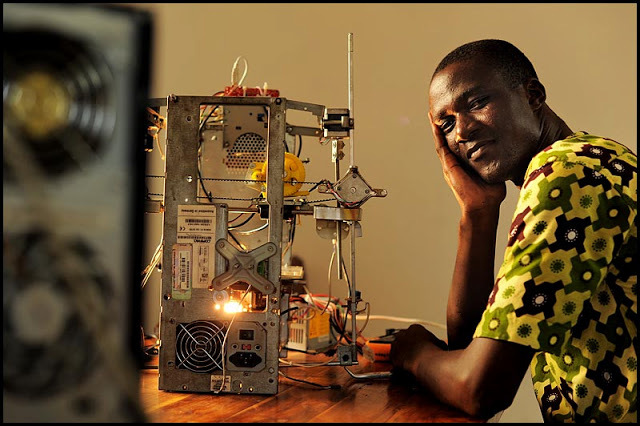 Kodjo Afate Gnikou has designed and created the first 3D printer to be made almost entirely from electronic waste. He found the materials at a local e-waste dumping site and created the printer with only USD$100 spent on sourced parts. Afate’s work is based out of ‘Woe-Labs’, a makers space in Togo’s capital, Lome, as part of their LowHighTech initiative which seeks to provide solutions to “African conditions and realities” (The New Africa 2015) through socially responsible design that utilise waste and recycling. The 3D printer is based on the Prusal Mendal an existing American/European printer, and utilises computers, printers and scanners found at local e-waste dumping sites. Its design is centred around the re-use of belts and rails from old scanners. For Afate, this design represents something much larger than his original prototype, he hopes to use the printer as a starting point to design living solutions that could exist on mars to combat an increasingly populated world. Afate has received over $4000 through French crowd funding site, Ulule, which has allowed him to begin making kits that will give anyone the opportunity to create their own e-waste-sourced 3D printer. Through this initiative he hopes to reduce the prevalence of electronic waste while also bringing Africa into the technological design sphere, stating “My dream is to give young people hope and to show that Africa, too, has its place on the global market when it comes to technology”(Ungerleider 2013). 1 – Oteng-Ababio, M. 2010, ‘E-waste: An Emerging Challenge to Solid Waste Management in Ghana’, International Development Planning Review, vol. 32, pp. 191-206. 2 – Greenpeace 2012, Guiyu: An E-waste Nightmare, Greenpeace East Asia, viewed 18 April 2014, URL <http://www.greenpeace.org/eastasia/campaigns/toxics/problems/e-waste/guiyu/>. In an attempt to better understand the intricacies of Indonesian culture and the effect globalisation is having on the diverse archipelago, I chatted to Ian Macintosh, a former ABC Senior Current Affairs reporter who has lived in Indonesia on and off for decades. Indonesia is a vastly globalising country experiencing steady socio-economic growth with extremely diverse cultural groups spread over thousands of islands. I was interested in gaining a more thorough understanding of the way government and society are keeping up with this level of globalisation, as there has been critique of the Indonesian government’s slow response to creating a nation-wide welfare system despite their increasing wealth (Pellini 2013). In the context of this, and greater Indonesian culture, Ian offered insight into the great importance family has to Indonesian people and the support network it facilitates. Indonesia’s collectivist culture means family has an expansive meaning – “The word family has a much broader meaning than how we know it. Their saying ‘big family’ can refer to your work mates, your football team, or the whole country.” In this respect, Indonesia’s collectivist attitude and strong sense family have lessened the need for rigid, government imposed social systems and, as Ian states, “The family unit in its many forms is a kind of quasi welfare system”. Ian gave the anecdote that in gaol, inmates have to feed themselves, allowing for insight into just how important this structure is. Another consequence of globalisation has been increased personal wealth and an emerging middle class. However, the World Bank states that despite the poverty rate halving between 1999 and 2003 (World Bank 2015), poverty reduction is now slowing, despite Indonesia’s steadily increasing wealth. I discussed this with Ian, confused as to why increases in wealth don’t necessarily equate to decreases in poverty, wondering whether it is a government priority, or whether the issue is just more complicated. Ian believes the perception that Indonesia is an overwhelmingly middle class country is a bit of a myth – “A lot of people have become middle class in the last few years through increased earning power, but I think people confuse class structures with purchasing power.” It appears, in some areas, policy and government are having trouble keeping up with the vast growth globalisation is facilitating, however in some areas it is definitely having a positive impact on entrenched social/political issues like corruption, with Ian stating “I suspect one if the benefits of globalisation has been a significant improvement in the way big business does a lot of its work.”. 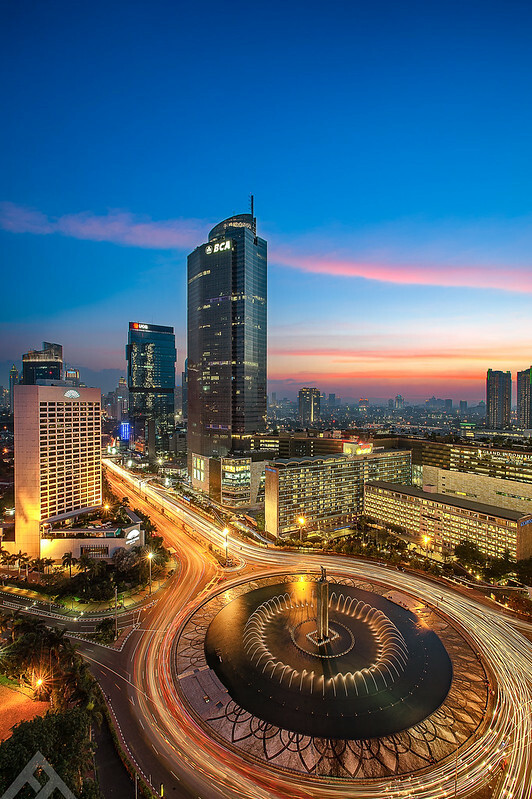 In Indonesia, globalisation and socio-economic growth are facilitating a phenomenal liberalisation of views and exchanges, specifically in relation to technology and social media. Indonesia is one of the highest users of Twitter and Facebook, but what is it about Indonesian culture that makes social media so appealing? And how do these desires intersect with conservative Islamic ideals in a country that’s populace is 88.1% Muslim (Rodgers, 2011)? In some areas, Western influence in Indonesia is noted as catalysing a regression in progressive Islam, (Harworth, 2012), however it is also propounded that “The effects of socio-economic change, modernisation and globalisation have resulted in more freedom and autonomy for Indonesian youth, and many are becoming increasingly liberal in their attitudes, ideas and behaviours…” (Harding 2008). Although the greater Muslim population in Indonesia is moderate, there still remains conflict between clerics and (predominantly) urban Indonesian’s surrounding the use of technology in alignment with Islamic beliefs, specifically in relation to photography and self-expression. The notion of pride is generally opposed in Islam (Hay, 2015) as it is believed it is intrinsic to other negative states of being like arrogance, superiority and conceit. There is great debate among Islamic clerics and the Muslim community around whether photography, specifically selfies, are haram (forbidden). In January of this year, an Indonesian author and Islamic cleric, Felix Siauw, ironically used twitter as a medium to post a 17-point manifesto condemning selfies, calling them a sin, specifically for women. In a translation by Coconuts Jakarta, Siauw is quoted as saying “[Five.] If we take a selfie and we feel cooler and better than others—we’ve fallen into the worst sin of all, ARROGANCE.” (Hay 2015) which demonstrates the imbalance between certain interpretations of Islam and the reality of an increasingly globalised community. This twitter tirade was not well received by the urban, tech-centric, Indonesia population and quickly prompted the hashtag #selfie4siauw, causing a massive spate of spite-induced selfies, much to Siauw’s assumed distaste. But what is it about Indonesian culture that facilitates such an overwhelming response to technology and social media? As a means of greater understanding the social climate the led to this embrace of technology, I referred to a BBC Impact news story from as early as 2011, investigating Indonesia’s growing interest in mobile technologies and social media as a means of communication and connection. Magareta Astaman, a prolific Indonesian blogger and author, believes Indonesia’s culture of connectedness, community and the desire to have a shared experience is what makes social media so appealing (Husain, 2011). During this time period Indonesia was producing 15% of the worlds tweets, with Facebook users jumping from 1 million to 40 million in just 2 years (Husain, 2011). This was a time when social media and technology were in not way as prolific and engrained as they are today. And with Indonesia’s smart phone use steadily increasing (Mahamel, 2014), Indonesian culture is set to be increasingly inextricable from social media and technology use.